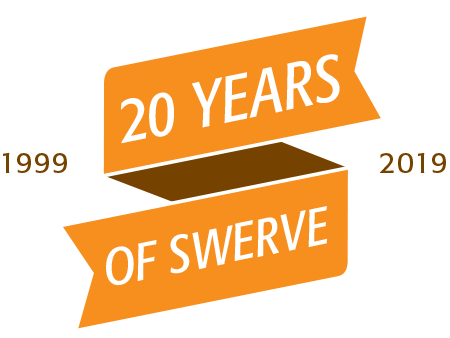 Swerve Design Group specializes in creative graphic design & engaging online experiences that move people to action. But it’s more than our design work, it’s our strategic process that navigates a path & strategically steers you towards your marketing destination. Intelligent, original and unforgettable custom logo designs and complete branding solutions. Interactive and engaging design and content management tools and SEO for all devices from desktops to tablets to mobile. Creative designs for reports, brochures, posters, packaging and all other tangible items. Full service solutions for all your marketing needs. Contact us to see how we can help you with your goals. We’ve leveraged the expertise we’ve gained since 1999 for your benefit. We’ve successfully launched thousands of projects and helped our clients succeed. There’s reasons why clients have stuck with us throughout the years. Our team of professionals are not just experts in Web design and print design, we become an extension of your business – passionate about the good work you are doing. Contact Toronto graphic design studio Swerve and discover for yourself what makes us your ideal partner. Enough about us – we want to know about your dreams and goals and see how we can help make them come true!